Blood cells are formed from stem cells in the bone marrow. 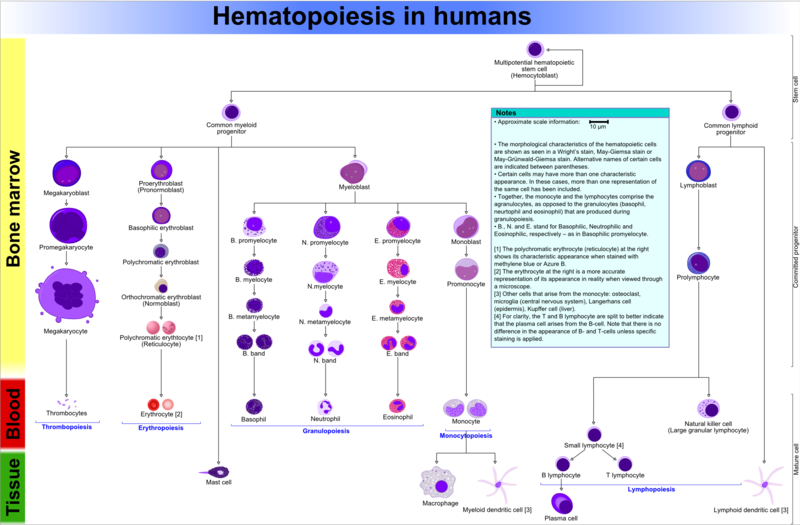 The diagram below illustrates this process and it shows which kinds of blood cells are ultimately affected in MDS. As the diagram shows, MDS is a disease associated with cells in the myeloid lineage. When myeloid cells look abnormal under the microscope, they are called dysplastic. Thus, the name of the disease: myelodysplastic. Because MDS patients have too few or improperly functioning blood cells, their blood does not clot properly and they are at higher risk for life-threatening infections than people who don’t have MDS. In addition, about 1/3rd of patients who have MDS are at risk for developing a blood cancer called acute myeloid leukemia (AML). MDS is diagnosed in least 10,000 people each year in the United States, and approximately 60,000 people are living with the disease in the US today. Most cases of MDS occur in people age 70 or older. About 90% of MDS patients have what is called de novo MDS, meaning the disease arises with no apparent cause. Approximately 10% of patients get MDS because of prior treatment for cancer, e.g., with chemotherapy or radiation, and are therefore said to have therapy-related MDS. A very small proportion of patients have MDS as a result of an inherited genetic condition affecting their bone marrow, such as Fanconi anemia. These patients are typically children, and the types of MDS that children get are generally different from the MDS that adults get. There are also some other bone marrow diseases, called MDS/MPD (where MPD means myeloproliferative disorders), that look a little bit like MDS but have some unique characteristics of their own. More research is required to understand the nature of MDS/MPD and how best to treat them. MDS can be divided into high risk and low risk disease, where higher risk MDS is associated with a greater chance of death or transformation to AML. The only way to cure MDS is through a stem cell transplant. Stem cells can be obtained from many sources, including bone marrow, blood, or umbilical cord blood. Unfortunately, stem cell transplants are not possible for all MDS patients because sometimes it is difficult to find a stem cell donor, and not all patients are healthy enough to undergo the procedure. There are other drugs available to treat MDS, and although some may prolong survival by a small amount, many simply treat the symptoms of MDS and none have the potential to cure the disease. Therefore, it is very important that more research be done to develop a cure for MDS.